Dental implants are a permanent replacement for missing teeth, and offer some distinct advantages over more traditional treatments like removable dentures or dental bridges. Patients who only need individual teeth replaced might also prefer dental implants to the placement of a ceramic dental bridge. 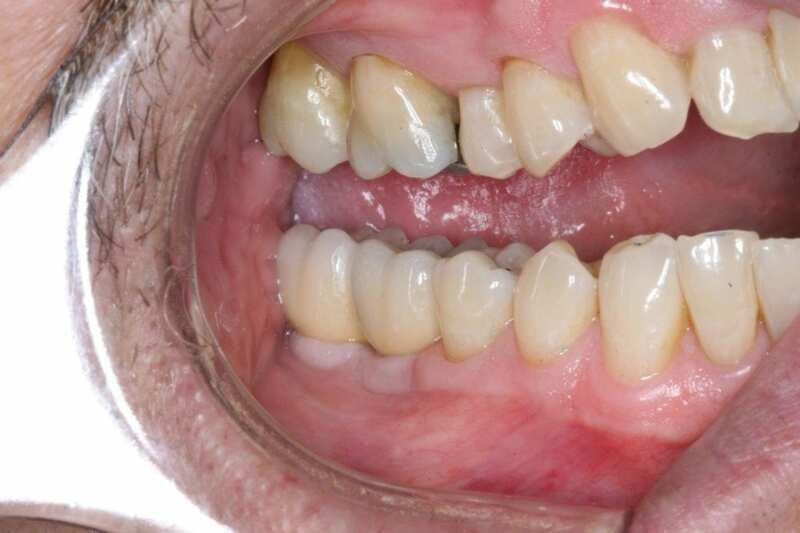 Unlike bridges, implants do not require any preparation or alteration of adjacent teeth. You can read more on our site about dental implants versus a bridge for replacing missing teeth. The actual dental implant consists of a small titanium cylinder that is placed through the gum into the patient’s jawbone to function just like the root of a natural tooth. This first step is performed by a surgeon. After the implant is placed, and as the surgical site heals, the jawbone will actually grow around and fuse with the implant, creating a very strong base to support a replacement tooth. 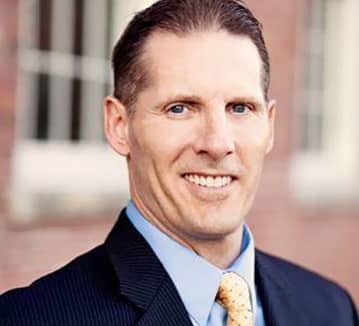 After the implant is secure, Dr. Szarek will cover the top of the implant with a porcelain crown that looks completely natural and will be virtually indistinguishable from a patient’s natural teeth. In the photo at left, below, the patient has a missing lower premolar, and a titanium implant has been placed by the surgeon. In the second photo, right, Dr. Szarek has placed the custom-designed replacement tooth over the root form. Notice how the tooth blends perfectly with the surrounding teeth. Because dental implants are rooted in the patient’s jawbone, they are much stronger than removable dentures and function like natural teeth. Studies have shown that many, if not most, denture wearers are dissatisfied with the fit of their appliances and often experience a significant loss of chewing function because dentures essentially “float” on the gumline and rely on adhesive to keep them in place. Patients who have lost all of their teeth can particularly benefit from dental implants. Once a patient has lost all of his or her teeth, including the roots, the jawbone begins to be resorbed by the body, as it senses there is nothing for it to support. This gradually leads to a condition known as facial collapse, as the jawbone recedes and the mouth loses its shape. This is why many denture wearers must have new dentures made to replace the original ones as they no longer fit. Eventually, these patients will likely not be able to wear dentures at all, since the jawbone will degrade to the point that it won’t support one. Obviously, this will have a serious impact not only on the patient’s appearance but their quality of life as well. In most cases, patients who still have sufficient jaw support are good candidates for dental implants. In some cases, bone grafting procedures may help patients who have already suffered some bone loss receive dental implants, which can halt the resorption process and preserve the remaining bone. There are some chronic health conditions that make dental implants a high-risk procedure. 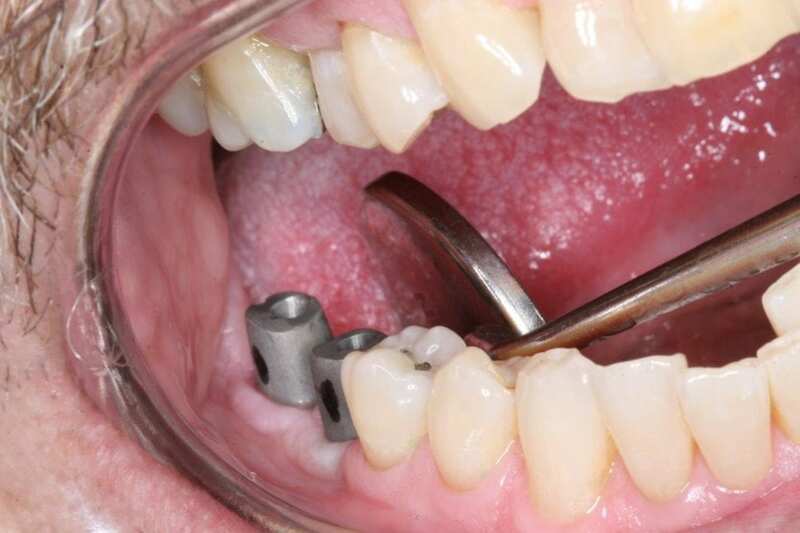 Patients with hemophilia, diabetes, or an immune deficiency are at higher risk for dental implant failure or contracting an infection at the surgical site. Patients considering dental implants should be sure to discuss any existing medical conditions thoroughly with Dr. Szarek. Patients who smoke are not good candidates for dental implants. Studies have shown that smokers experience dental implant failure at a rate two-and-a-half times greater than nonsmoking patients. Pregnant patients should wait until after they deliver before pursuing dental implants. Patients with alcohol or drug problems are not good candidates for treatment with dental implants. Chronic alcohol and drug use contribute to health conditions that lead to implant failure and likely affect the ability of the patient to adhere to the rigorous dental hygiene needed to maintain the implants in good condition. 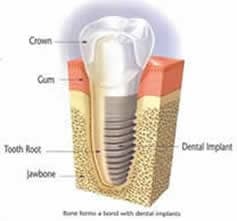 If you are interested in dental implants, contact our office to set up an initial consultation. If concerns about your comfort or ability to undergo a lengthy procedure are holding you back, discuss your concerns with Dr. Szarek. He will inform you about how we will make your experience comfortable for you.